Unless you are writing a journal entry, or a secret document you never intend the world to see, you will endure criticism. Anyone who reads your book, poem, short story, or blog entry, will have thoughts about it, whether they express them or not. Your words will resonate with them--or they won't. Your characters, the setting, your pacing--all of those things will either engage them, or they won't. So, why not get some good, solid criticism before you let your words go public, so that you can change those things that need to be corrected, before it's too late? Well, because asking people whose opinion you value to possibly tell you things they don't like about this thing you've been pouring your soul into, is absolutely frightening, that's why! Many writers are so terrified to hear that their "baby" is actually really ugly, that they don't ever present to critique groups or beta readers. What's worse, some writers are so invested in their project that even if they do have beta readers, when those readers outline all the things that are wrong with the book, the writer has a meltdown. Sometimes they go on Facebook to get validation and commiseration, they may discount the criticism, or possibly take it so much to heart that they don't touch the project again. Step 1: Say, "Thank you." You did, after all, ask for them to read and comment. They sacrificed time to read your project. Step 2: get out the salt. You will need at least one grain of it to take with each comment. You have to take into account that everyone has their own pre-established likes, dislikes, and idiosyncrasies that will color their perception of your work. When people say "This doesn't work for me," there is always a reason. However, the reason may be completely different than what they think it is. Pay attention to those things that are unsettling to your beta readers, but be aware that their solution is not necessarily the solution. Step 4: Pray or meditate on it. I believe that God wants me to use my talents as a writer to help His children. Because of that, I also believe that He will direct me in the use of my writing, if I ask Him. That may not be your belief, but I promise if you take time to reflect on the things that your beta readers have told you, you can be more mindful of what changes you need to make and which ones are not necessary. Step 5: Be true to yourself; true to your story. But don't be afraid to "kill your darlings" if necessary. IF NECESSARY. You don't have to. Sometimes one reader may not like something that may be perfectly wonderful to another. YOU get the final say. Step 6: Do it all over again. Make changes, get feedback. Make more changes, get more feedback. Think of it as sanding furniture, or polishing a stone or a car... you refine, refine, refine, with finer grit sandpaper, until you can truly see the gem shining through. 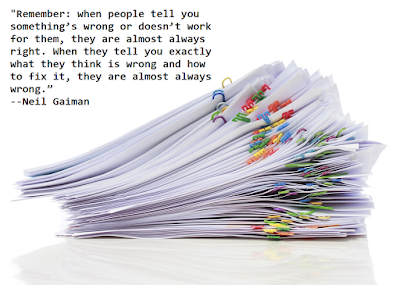 What advice do YOU have for writers dealing with critiques? Post in the comments! This is great. I'm about 2 months away from sending my first novel out to a few beta readers. This is my fourth draft, and draft 3 was the first version I sent sections out for feedback. I used that feedback to direct this new draft. I'm new to all this as a fiction writer (I've taught academic writing at universities), but my advice is that you don't have to show anyone your first draft. That's for you. But send things out for feedback even before you feel fully ready. 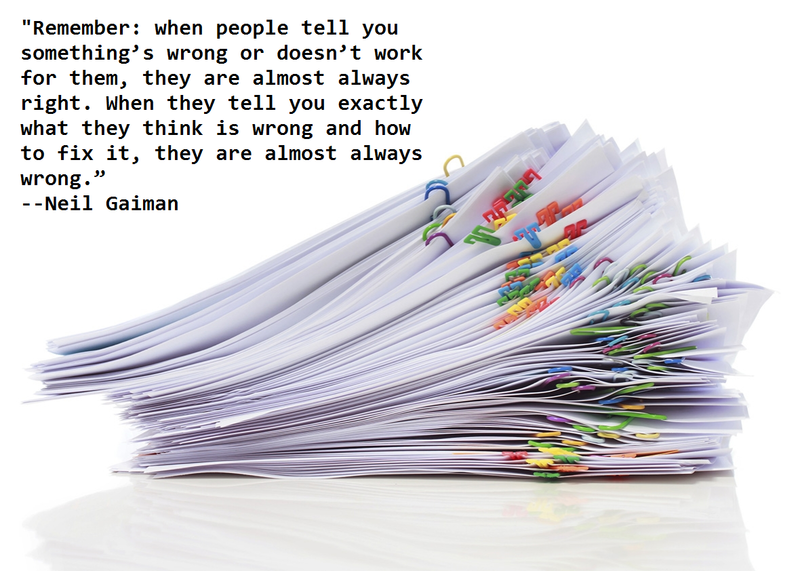 The criticism is a valuable part of the process and you probably can't get your work ready for publication without it.